Awards day in mid Wales today. The Good Pub Guide 2012 names us Dining Pub of the Year in Wales for the second consecutive year. And the Michelin Guide finally seees fit to recognise one of the Eatdrinksleep stable with a Bib Gourmand, which recognises good cooking at unusually sensible prices. How do we deal with awards in this industry? – teams have worked hard to be in a position where we are in consideration for an award. Recognise their efforts and skill. – we can all look at our shoes and pretend we don’t care about awards. But for a small business the PR opportunity is like a tank of oxygen half way up Everest. Tell the world, quickly and quietly, that you’ve been recognised. – ultimately the decision of an award is a fairly subjective one and there are others who could equally well be singled out in any one year. Don’t believe the hype. – the guidebook view is based on guests’ experience earlier in the year. A time that is simply not relevant any more. Focus on the next service. – you sign a deal with the devil when you win an award. Your regular guests’ expectations soar. New ones come with a heightened sense of anticipation that can only be met by a better service. Meet the challenge. After a week in Cornwall, back in Wales after a week to my favourite moment of the year: the first pod of garden peas from the Griffin’s garden. No taste is ever sweeter, no moment ever more satisfying that standing amongst the rows of Pisum Sativum and running ones finger down along the opened pod and scooping half a dozen fat, little peas into one’s mouth. Really, they should be going to the kitchen, but they won’t miss a few pods. There are so many peas and broad beans, we are sending the surplus down to The Gurnard’s this afternoon. Along with a box of blackcurrants and some garlic, a small fraction of the 300 heads that sit drying in the barn. Joe’s garden is truly at its very best at the moment. His tour and barbecue this Friday is fully subscribed, but do let us know by email to laura@eatdrinksleep.ltd.uk if you are interested in joining his 22 September tour, the last of the season. Last weekend, twenty four hours of isolation from children and from the Vaio. First stop: testing a seaside hotel behind Camber Sands (www.thegallivanthotel.com). A brave idea indeed, in a somewhat unpreposessing location. But Harry Cragoe and Tudor Hopkins have done a fine job, with the 18 rooms full on a Friday night in June and the restaurant buzzing to the noise of 50+. A recipe that seems to work and a few thoughts for own future. The next morning, some shock therapy coffee at The George in Rye (www.thegeorgeinrye.com). Another example of young British hoteliers revolutionising provincial British towns, putting the hotel at the heart of the community. This pair, Alex and Katie Clarke, were at University with me twenty odd years ago. What use our Arts degrees now, except in editing the menus? I paused to reflect that the two and a half hours that it took us to get from London to Rye was the same as it takes me every week to get from London to The Griffin. Would that more from the south east understood how easy it is to make the leap across the Severn Bridge. I tried not to be too pleased also at how poorly the Kent sea compares to that which laps against our Cornish beaches. Another world. On the way home, a brief stop at Chapeldown Vineyard near Tenterden. A fully booked restaurant. A restaurant named after the chef. I have never been a fan of that kind of self-regarding chakllege to the fates. Also a restaurant in a vineyard that doesn’t offer glass sizes of 125ml! But English (and Welsh) wines remain on the up. More thoughts on that anon. Home to children and Vaio. Greeted in that order. I promise. We always said that the Brecon Beacons was “Scotland without the midges”. Well, 2011 may well now be the year when that means something. A number of Scotland based bodies are forecasting that the midge invasion this year will be 800 times worse than usual. And the “usual” is not exactly agreeable. It isn’t our style to spend too much time thinking about the travails of our competitors, but I can’t help but wonder if this might be the year when visitors begin to foresake Scotland for the equal merits of Wales. Back to scratching my head. Though not as much as they will up north in the summer. Are we sure that a Head Chef is in the list of prescribed ingredients for this brew? This Friday sees our inaugural British Drinks Producers dinner. The scarcity of population in our part of world makes it difficult to attract many to our wine dinners, but this one has touched something in our guests and all our tickets were sold as of last week. A sensible price certainly helps. £39.50 for five courses matched with liquid refreshment from the best of British booze. Three beers from our local Breconshire Brewery, including “One for the Road”, brewed especially for us to celebrate our 10th Anniversary. The team, led by Assistant Manager Rhodri Morgan, have played a big part in developing the beer, which includes a decent slug of apple juice from Talybont’s Aber Valley Fruits, and which will continue to be on sale at the Griffin for a few weeks after the drinks evening. And to match the canapes and the starter, an Elderflower Champagne and a perry from Polgoon Vineyard, which is close neighbour to The Gurnard’s Head. Please do sign up to our newsletters at enquiries@felinfachgriffin.co.uk and we will keep you in touch with any further evenings like this. In our part of the world, we are prone to fretting whether the metropolitan classes have our best interests at heart. Pesonally, I think this concern is sometimes overdone, although some of the media’s interest in rural affairs can verge on the patronising and misty-eyed. However, it is good to report that the judging panel for the BBC Food & Farming awards have shortlisted two of our suppliers here in Border country for one of their much coveted awards. Alex Gooch has been making sourdough bread for us for several years now. He is a true artisan, a food hero and dedicated utterly to the making of perfect bread. 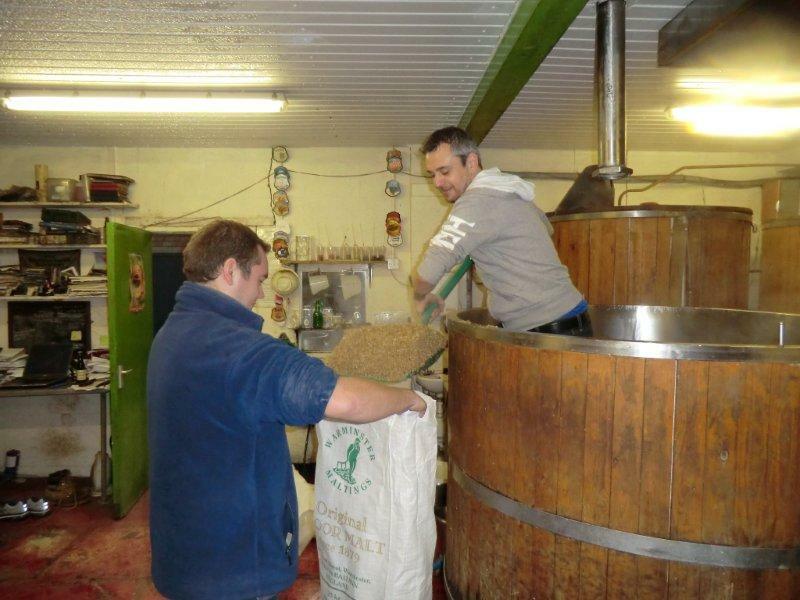 Wye Valley Brewery are one of the four breweries in the area that we are proud to buy from. The sheer variety of the products is a delight, using Herefordshire hops and setting themselves apart from the rest by using locally farmed barley as well. Congratulations to both of them just for being shortlisted. If either was to win……. For more information on the awards, go to http://www.bbc.co.uk/radio4/features/ffa/2010/.